As we head into one of the busiest and often the most stressful months of the year, you might want to consider creating a budget for your brain which will help you through December and give you a good foundation for some long-term gains during 2018. Rather than income and expenditure, let’s look at what drains your brain energy and what re-charges your brain energy. Allowing yourself to get overwhelmed with everything there is to do. Trying to make too many decisions in too short a time. Decisions wear your brain out quickly and, once that decision-making energy is gone, you can easily make a decision which you will regret for a long time. Procrastinating will mean that you carry the burden of things you want to do now over days or even weeks, then have to rush at the last minute. Spending more money than you planned. It is all too easy to forget what you have already spent, give in to impulse purchases, and then dread how big the bill will be when it finally comes in. Getting angry about what someone else should or shouldn’t do. Being angry takes an enormous amount of energy and carrying resentment against someone for past wrongs is like taking poison and waiting for the other person to die. Eating too much, drinking too much, spending too much all drain your energy. As does not exercising and cutting back on sleep. I am doing the very best I can with the time and energy I have right now. I have handled difficult situations before, I can handle this one. It is much easier on your brain if you make important decisions ahead of time. Once you have decided on your spending budget, decide what you will buy for each person. Be careful you don’t get caught up with trying get a “better” present than last year’s or even something “better” than someone else’s gift. That kind of competition is unwinnable and very draining. Consider using a “cash only” approach this Christmas. It is a huge habit change, but I have been doing it for the last three weeks and it is working. I feel very pleased with myself and feel truly in control of my finances for the first time in many years. We can get very angry when we tell ourselves that someone should or shouldn’t do or say something. That is because the other person has a perfectly good reason for what he or she is doing. Your sub-conscious (which you are telling all the should’s and shouldn’t’s to) believes word for word what you are saying and reacts with anger when the other person does not change his or her behaviour. If you tell yourself commands like “I should make a list tonight” or “I shouldn’t eat that” and then ignore your own advice, you will make yourself very anxious every time. The answer is to use the word “prefer” which gives you and your sub-conscious more flexibility. Using these ways to frame what you tell yourself will reduce your anger and anxiety very quickly. Finally, give yourself a gift by deciding to forgive someone who has done you wrong. The act that hurt or offended you may always remain a part of your life, but forgiveness can lessen its grip on you and help you focus on other, positive parts of your life. You can forgive the person without excusing the act. Forgiveness brings a kind of peace that helps you go on with life. Having the pleasure of a lovely meal and enjoying a drink is wonderful. But pleasure is one of those things we can easily overdo. One piece of chocolate cake is delicious, a second piece not quite so good, and a third piece can leave us feeling regretful and even guilty. Develop your skill at being happy and finish the pleasure while it is still pleasurable. The above 6 ideas will help you recharge your brain energy in the moment. 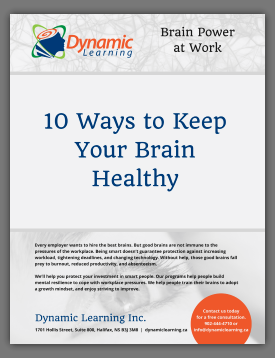 An energized brain allows you to focus your attention, connect the dots, regulate your emotions, notice connections, predict outcomes, and make smart decisions. A depleted brain distracts your attention, reacts impulsively, loses the thread, can’t see implications, and makes unwise decisions. Walk fast for 30 minutes at least 3 times a week. Once you are doing that 3 times a week, each increase of another day per week of exercise will give you huge brain energy reserves. See Build and Condition Your Brain, March 2024. Reduce your stress by talking more rationally to yourself. See Disputing Your Irrational Thoughts, February 2014. Develop a growth mindset and a love of learning. This takes effort, concentration, and practice to do. Neuroplastician Michael Merzenich argues that practicing a new skill under the right conditions, changes hundreds of millions and possibly billions of the connections between the nerve cells in our brain. See A Fixed vs. Growth Mindset, June 2016. Get enough sleep. Scores of studies show that sleep physically changes the brain by allowing us to consolidate learning and memory. It is when we sleep, that the brain can use our spinal fluid to flush out the debris of the day, including bits of amyloid. See Wired and Tired, November 2013. Eat well and reduce sugar, salt, and some fats. Convincing scientific evidence indicates that long-term, healthy dietary habits may prevent future brain aging and memory decline and help protect our brains from developing Alzheimer’s disease symptoms. See Your Gut has a Brain, February 2016.